This delicate-looking historical reproduction Shaker fancy Knife basket, handwoven of fine white ash split and cherry wood, was personally hand-crafted by Kathleen Becker! This beautiful mid-size Shaker basket was crafted using traditional materials and methods using hand-pounded white ash splits for the uprights and weavers. 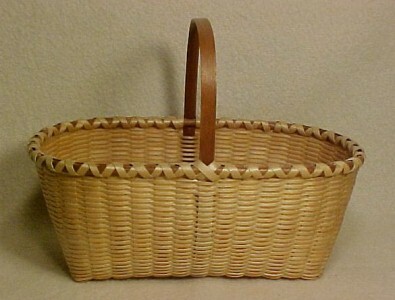 It was formed and woven over an exact replica of the original Knife Shaker Basket wood basket mold, using traditional and historical Shaker basket craftsmanship, Shaker basketmaking techniques and attention to detail. Notice the sharp corners and the straight-cut sides of this lovely ash basket - Shaker basket design at its finest! Each piece of ash used as a weaver is thinned down at the overlaps and tightly packed down after the ash dries. Ash wood splint swells when damp, which is how the entire basket is woven - wet! The carved cherry wood handle is delicate and elegantly beautiful with its very thin tapered ends inserted into the basketweaving of the basket. The basket rims are hand-carved cherry wood, sanded smooth, and steam-bent over a basket handle form for a perfect fit to this Shaker basket. Both the cherry basket handle and cherry basket rims offer a stunning and elegant contrast to the creamy colored ash of the basketweaving. Although delicate-looking in design, this Shaker basket is crafted to be used, as the ash and cherry wood gives this basket its strength. This elegant Shaker basket measures 9" long x 5.5" wide x 3.25" high, 6.5" high at handle, and has been signed and dated by me. The Knife Shaker basket is in MINT condition, used only on display, and was crafted in 1997. Information about Shaker Baskets can be found here.